Over the past few months, we have been lucky to read the stories of the salons and day spas that entered our Salon Secrets Competition. Salon and spa staff and owners from across the country shared compelling stories about what makes their businesses thrive—whether a unique specialty or a special touch with customer service. 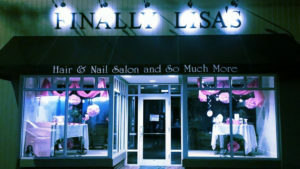 The SASSI staff had a difficult time choosing a winner from the many qualified entries, but there was one story that stood out: Lisa Bodreau of Finally Lisa’s Hair & Nail Salon in Southbridge, Massachusetts. Lisa founded Finally Lisa’s 30 years ago. Now, with six master stylists/colorists and one nail technician on staff, she has built her business into a local fixture with a combination of teamwork, ongoing education, and community charitable involvement, as well as a commitment to the needs of local clients. In 2006, the Finally Lisa’s team began raising awareness and funds for cancer-related causes by encouraging people to add pink streaks to their hair. Over the past ten years, Finally Lisa’s campaigns have evolved while raising $25,000 for organizations including the Cancer Center at Harrington Hospital and the American Cancer Society, as well as individual families affected by cancer. “Helping each other—also helping your community—is a secret to not only business success but success as a human being,” Lisa writes in her entry. Of course, the Finally Lisa’s stylists and staff also stay educated on the latest trends, with ongoing training and education. “We’re constantly striving to bring the trends to our clients in a way that would fit in their everyday lives,” says Lisa. As the contest winner, Lisa will receive a membership, entry, hotel stay and travel voucher for the upcoming America’s Beauty Show in Chicago, March 25-27. Join us in congratulating Finally Lisa’s—and wish Lisa well on her trip to America’s Beauty Show in Chicago! P.S. We’ll introduce you to our runners up and tell you more about Lisa and her team in the months to come. Thank you to everyone who entered.